Give your pet sweet storybook style with this hand-knit unicorn sweater. Trixie dreamed of prancing through enchanted forests. Give your pet sweet, storybook style with this hand-knit unicorn sweater. 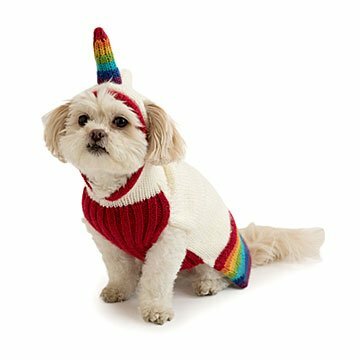 The comfy acrylic outfit is lovingly detailed with an adorable rainbow horn, colorful trim, and leash opening at the neck. Handmade in Peru. Click to see size chart. Machine Wash. Tumble dry cool. I wish I could buy more sweaters like this one. This product is SO CUTE, but I put it on my dog (who doesn't even have all of her teeth! ), and it immediately started to fray and now there is a big hole in it, and threads are hanging from her sweater. I had high hopes, because it's super adorable..but it just falls apart, and I'm sad. My boys look absolutely adorable in these sweaters seeing my little unicorn dogs walk around the house cracks me up. The sweater is super soft and cozy for them. Bought a small for my 6 pound dog and a medium for my 10 pound dog. He's just on the bigger size even though he's a maltese. My dog loves this sweater and gets excited every time he see me getting ready to put it on him. It's warm but not overly hot. He looks adorable in it. My good friend bought this for my beloved cavachon. It's very warm and well made! The hood is designed so that the unicorn horn stands up well. I love the hole in the back for my dog's harness/leash. My dog doesn't love having things on his head so he shakes until the hood comes off. It's still cute and if you have a patient dog then that might not be an issue. Great for winter Pride events! The product itself was adorable and well made. I could not ask for anything more! My experience with uncommon goods was terrible. I ordered the product, which is not a custom good on December 4th and did not receive it until December 27th so it was too late to give for the holiday. I was told by customer service that the item was on the way on multiple occasions only to be told on the 23rd that it was not even shipped yet due to some sort of outage. They then shipped it overnight but not in time to get it to me on the 24th. So that experience was frustrating. While I like the product I would recommend the artist look for another vendor to sell it.